This is the first article in a series addressing diversity in Silicon Valley and Corporate America. The series explores solutions and best practices for increasing diversity in the workplace. In this article series, the term "homogeniuses" refers to highly intelligent people who look alike and have similar backgrounds. Alternatively, the term "heterogeniuses" refers to highly intelligent people who come from diverse backgrounds with respect to race and gender. HBO's sitcom Silicon Valley, in many ways, reflects the real demographics of companies like Google, Facebook, Twitter, and Apple. It's nearly all white and Asian, there are virtually no blacks and Latinos, and you're at a loss to find many women in the mix or in significant positions of power. The sad reality about Silicon Valley and the tech industry is that they just aren't diverse enough. Yes, these companies are full of very bright people, but they are predominantly staffed with and run by homogeniuses (i.e., highly intelligent people who mainly look alike). This business model with similarly-looking smart people has worked for many of them up to now. But if companies want to remain relevant and increase their profitability, they need to change and diversify. Soon. To succeed in the 21st Century, they need to implement strategies to attract and keep diverse talent at their companies. Let's look at the numbers. 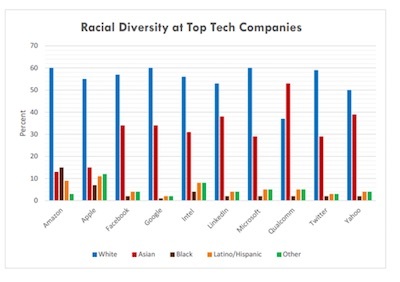 Google's workforce is 2% black, 3% Latino, 30% women, and 91% white and Asian. None of the other major tech giants like Facebook,Twitter, LinkedIn, Microsoft, and Yahoo are knocking it out of the park either. Sources: Amazon, Apple, Facebook, Google, Intel, LinkedIn, Microsoft, Qualcomm, Twitter, Yahoo. The handful that seem to be a few baby steps ahead either have brick and mortar store locations or massive fulfillment warehouse centers with hourly wage workers. This could explain why they're doing slightly better than the other companies. Looking at the aggregate US workforce chart above, if we separate out who's in management or holding technology jobs, the number of black and Latino workers atAmazon and Apple immediately falls and starts resembling the other tech companies. There's no way to characterize the diversity data other than to say the results are weak and the tech industry as a whole gets a failing grade. While these companies can point to great success with minority hires from diverse Asian communities, this doesn't excuse the industry's broad failure with diversity. Diversity is about reflecting the US population in your workforce. We need to frame the discussion in terms of underrepresentation. To begin addressing longstanding issues, Silicon Valley needs to focus on hiring and promoting blacks, Latinos, and women. Tech companies claim they have a pipeline problem and struggle to find candidates, which has some merit. However, the reality is that Silicon Valley isn't doing enough to attract, retain, and promote diverse talent or create a welcoming environment for women and minorities. Companies can and should be doing more to promote an inclusive workplace and institute better hiring practices that can diversify their ranks in strategic and lasting ways. The numbers speak for themselves and also serve as a red flag for the industry. The key question is what are these companies going to do about it? When I worked at one of the largest global financial services firms overseeing its diversity recruiting efforts for its US businesses, I heard similar pushback. "Financial services has a pipeline issue. There aren't enough women in business school. Not enough blacks and Latinos have the quantitative skills to crunch the numbers at a big bank." However, through strategic partnerships and targeted initiatives, we were able to make improvements with women and underrepresented minorities. What change really requires is: (1) having a long-term vision, (2) defining diversity and identifying your target population, (3) building a strong team to tackle the issue, (4) protecting and dedicating resources to implement initiatives, and (5) creating a robust diversity platform for the organization. Diversity needs to be seen as a way of doing business and integral to a company's long-term survival and growth. Where companies tend to go wrong is: (1) failing to allocate adequate human capital and dollar resources, (2) treating diversity like it's a PR campaign or a form of philanthropy rather than about business, the bottom line, attracting and retaining talent, and a means to staying relevant in the 21st Century, (3) not having robust follow through and patience to support a long-term commitment, (4) getting buy-in at the top while having a poor strategy to address resistance or inertia from mid-level managers, (5) recognizing that to move the needle, you have to approach diversity from many angles simultaneously - recruitment, retention, advancement, professional development, and internal accountability, and (6) not tackling this issue like any other business challenge, such as product development or service delivery when seeking to improve customer value. 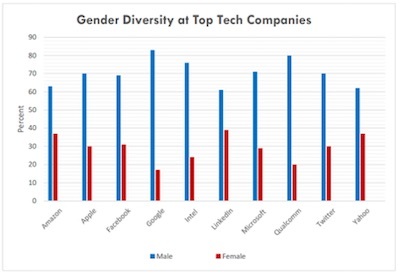 Given the costly gender discrimination lawsuits popping up in Silicon Valley against tech and venture capital companies, as well as the influx of companies earmarking funds for "diversity," companies need to start really tackling this issue with tangible and innovative strategies. Here's why: Companies that have more diverse employees and corporate boards tend to outperform their less diverse counterparts. 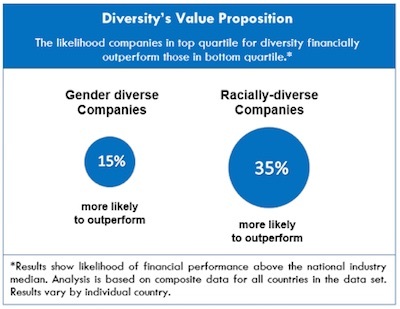 A recent McKinsey & Company study showed that gender-diverse companies are 15% and racially-diverse companies are 35% more likely to outperform less diverse competitors. This translates into profits and returns. 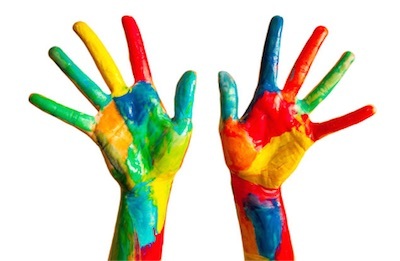 Companies that recognize that diversity goes well beyond tacos in the cafeteria on Cinco de Mayo have a clear business opportunity and will have a competitive advantage. By implementing and pioneering diversity initiatives that have substance and staying power, they can recruit and retain talent, compete better, and grab market share. Besides, it's more fun to work in an inclusive, heterogenius environment. That's why I championed diversity in Corporate America and now specialize in diversity and inclusion. Working with different people adds more spice to the day, flavor to teambuilding, color to workplace innovation, and sizzle to your balance sheet. The Azara Group (TAG) is a consulting firm that promotes the development of leaders in an increasingly competitive and diverse marketplace - providing strategy consulting services and leadership training services to advance professional and life success. TAG leverages expertise in career strategy, diversity, negotiation skills, and business acumen to provide strategic advice and consulting services to help people and organizations get what they want, achieve their goals, and advance their business and career objectives. TAG also helps companies better attract, retain, and promote diverse talent, and develop robust diversity platforms and strategies to create a more inclusive workplace. Fatimah Gilliam, Esq. is the Founder and CEO of The Azara Group, which is a leadership development and strategy consulting business. She started her career on Wall Street as a corporate attorney, worked for one of the top global financial services companies and the United Nations, and is a successful entrepreneur. Since launching her company, she has counseled institutional and Fortune 500 clients on being strategic in negotiations to expand leverage and bargaining power, how to strategically position their businesses for growth and continued success, and how to improve diversity initiatives to better attract, retain, and promote diverse talent. Fatimah has also helped private clients negotiate six-figure increases in compensation and severance packages, and has counseled business leaders on navigating their ascent up the corporate ladder through being more effective leaders and managers. As an expert negotiator and career strategist, she has been interviewed and written articles on negotiating, leadership development, the sports industry, diversity, the technology industry, being an influence, career strategy, and the "art of persuasion." Fatimah is a frequent speaker and has spoken to groups of professionals, top executives, athletes, and students about how to position themselves for career success. She is a graduate of Harvard University, Columbia Law School, and Wellesley College, and a member of the New York City Bar's Sport Law Committee.